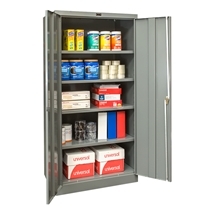 Metal storage cabinets are a great way to store classroom, lab and office supplies. They're exceedingly strong, can stand up to years of heavy use and can be found in a variety of colors. There are a few things to think about before you purchase a metal storage cabinet, mainly: door style, type of shelving and dimensions. Solid doors are best for maximum privacy and security, and are often more durable than mesh or clear glass doors. Clear doorsallow you to keep an eye on valuable items, but still lock for added security. Typically, clear doors are glass or plastic. Cabinets with no doors are a fine option if theft or privacy isn't a concern. Metal cabinets can come equipped with adjustable shelving, open cubbies, drawers or shelving of various shapes and sizes. Adjustable shelving allows for the most flexibility, while open cubbies are a great option for early learning classrooms, as they're easily accessible to little ones. Take inventory of the items you need to store before make a purchase, and check the cabinet's weight capacity as well. Remember: the lower the gauge, the stronger the steel. If you need more work space, consider a desk height cabinet, which can often double as a work surface. Desk height cabinets are typically 28 to 30 inches in height. Take note of the cabinet's measurements before you make a purchase, and be sure to measure the space where your cabinet will sit. People often underestimate the amount of storage they need.